Municipalities have engaged in heated competition to host a planned SK hynix-led semiconductor cluster as the government-backed 120 trillion won ($106 billion) project will create thousands of new jobs and generate hundreds of billions of won in new tax revenues. According to the Ministry of Economy and Finance, Friday, the government plans to make a final decision on the location for the semiconductor cluster by the end of next month. Those participating in the race include Yongin and Icheon in Gyeonggi Province, Cheongju in North Chungcheong Province, Cheonan in South Chungcheong Province and Gumi in North Gyeongsang Province. In December, the Ministry of Trade, Industry and Energy announced a plan for the project to create a semiconductor cluster in an effort to create synergy in the semiconductor industry that has been hit by weaker global demand and a drop in sales prices. Since then, competition has heated up among politicians and civic groups as well as citizens in the regions. Under the plan, a total of 120 trillion won will be invested for the next 10 years beginning this year to build new semiconductor fabrication facilities for SK hynix and those of subcontractors. In a race to host the cluster, Yongin and Icheon are stressing their geographical advantage as the regions are near Seoul, while other regions are claiming the government should seek balanced development between regions. Gyeonggi Province Governor Lee Jae-myung has been active in supporting Yongin and Icheon. "I will redouble efforts to host the semiconductor cluster and nurture higher value-added industry to overcome slow growth," he said during his speech at a meeting of the provincial assembly, Tuesday. The previous day, Cheonan City Council members held a press conference, saying the city is the optimal location for the semiconductor cluster. "Transportation is convenient around Cheonan. In addition, relevant businesses such as Samsung Display and Samsung SDI are in the city," they said. Cheongju highlighted its existing factories for SK hynix and 160 subcontractors as a reason for its selection. Gumi has vowed to offer various benefits to SK hynix including special incentives. Competition between municipalities has been overheated especially after a domestic newspaper reported Wednesday that the government has already decided to build the cluster in Yongin. 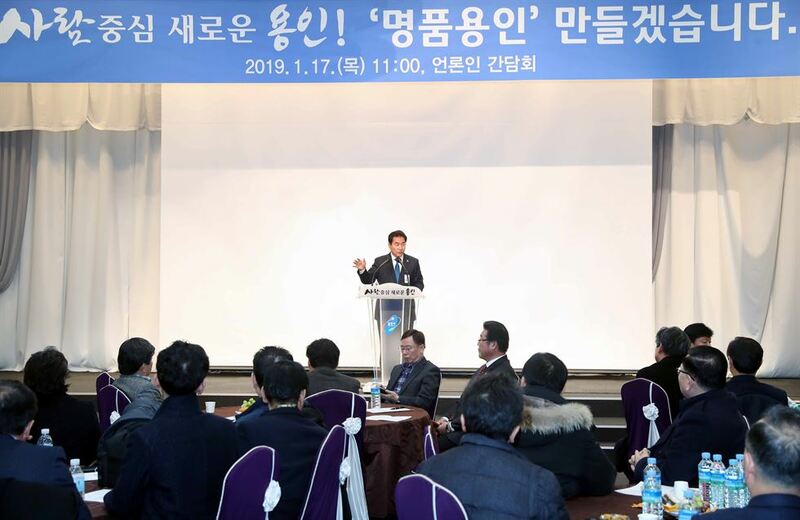 Members of a civic group in North Chungcheong Province held a news conference on Thursday, saying, "The government should cancel its plan to build the semiconductor cluster in the region around the capital." Regarding the report, an industry ministry official said, "Nothing has been decided concerning the location." On Friday, SK hynix CEO Lee Seok-hee also said "Nothing at all was decided" during his meeting with reporters ahead of a meeting of the Korea Semiconductor Industry Association in Seoul.